Uprostřed noci - žhnoucí zrození, líhne se bytost - ohně stvoření. Fenix. Tajemné zvuky proříznou tmu, i Ty můžeš pomoci mu. Cílem je společnými silami vybudovat Fenix Festival - psychedelic music & art & fire & tribal. Festival, který aspiruje jako alternativa k zavedeným festivalům v ČR s přesahem do světa žonglování (nejen ohněm), jógy a umění. Limited capacity 1000 tickets! ► Send the money to bank account: 1599018016/3030 / IBAN: CZ87 3030 0000 0015 9901 8016 and Please! write in the note your name and email address to which we will send the confirmation. Midnight, from the glowing embers hatches a creature born of fire. The Fenix. Strange sounds divide the night. You can help the beast spread its wings and take to the stars. The bohemian tribes, Synaptic Dreams and WizArts wil join forces to create a psychedelic festival of music, art and fire. 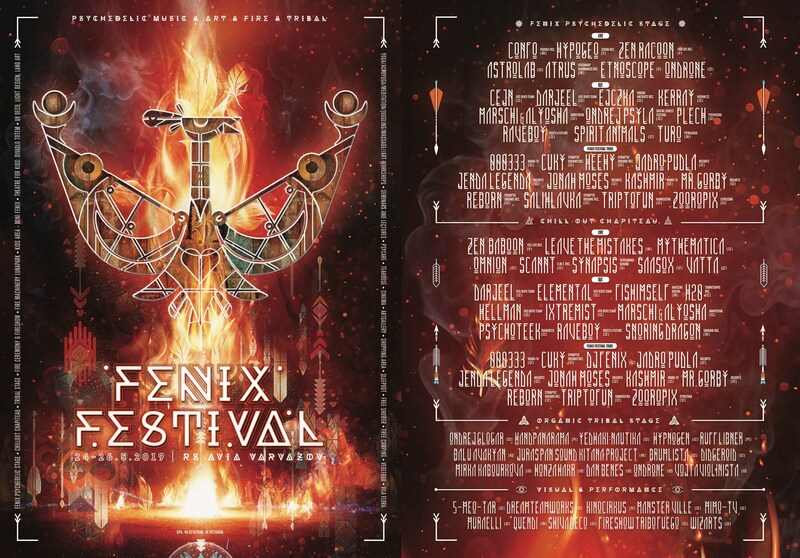 With the help of the extended family members Otrozona and Mimo-TV they will work to build a psychedelic music, art & fire festival “FENIX” to be alternative to the established festivals in Czech Republic and spanning the worlds of juggling, yoga and art. COME RIDE THE FENIX WITH US! - A CALL FOR ARTISTS – workshops, landart, juggling, fireshows, drummers, shops. Come to beautiful Czech Republic and help the fenix to rise from the ashes and to fly to the stars. ✶✶✶✶ PŘEDPRODEJ // PRESALE FOR ENGLISH SCROLL DOWN✶✶✶✶ CZ: ► V PRODEJI ► 2. VLNA 900 CZK (40€) 1.2.-30.4.2019 VYPRODÁNO ► EARLY BIRDS 700 CZK (30€) max 50 lístků či do konce listopadu: VYPRODÁNO ► 1. VLNA 800 CZK (35€) 1.12.2018 - 31.1.2019 ► NA MÍSTĚ (POKUD ZBYDOU) 1000 CZK (45€) (Pozor: omezená kapacita max. 1000 lístků celkem) ► Platby můžete zasílat na účet: 1599018016/3030 / IBAN: CZ87 3030 0000 0015 9901 8016 Do poznámky Prosím! připište svoje jméno a email, na který vám do týdne potvrdíme příjem. ENG: ► NOW AT SALE ► 2nd PHASE 900 CZK (40€) 1.2.-30.4.2019 SOLD OUT ► EARLY BIRDS 700 CZK (30€) max 50 tickets untill 30.11. 2018 SOLD OUT ► 1st PHASE 800 CZK (35€) 1.12.2018 - 31.1.2019 ► AT THE GATE (WHEN THEY ARE TICKETS LEFT) 1000 CZK (45€) Limited capacity 1000 tickets! ► Send the money to bank account: 1599018016/3030 / IBAN: CZ87 3030 0000 0015 9901 8016 and Please! write in the note your name and email address to which we will send the confirmation.